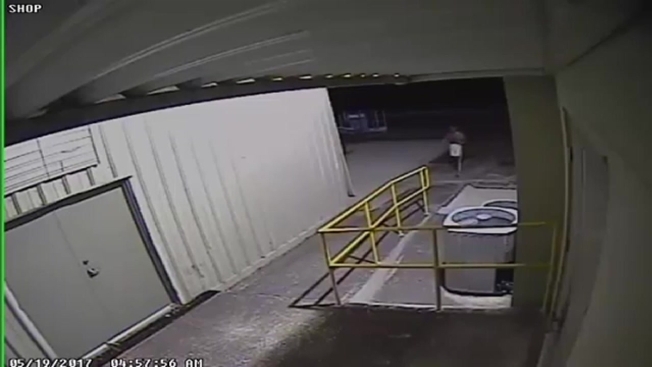 RAW VIDEO: Surveillance footage released by the Polk County Sheriff's Office shows a naked man stealing a truck with a large swan sculpture in the back from a cold storage in Lakeland. A large, black-and-white checkered statue of a swan that was stolen in Florida by a naked man has been found. The Polk County Sheriff's office says the statue was found by a 32-year-old man who was fishing on a pond in Lakeland. The man returned home from fishing Thursday and told his family about the statue. When they saw the news of the stolen statue on TV Friday, they called authorities. Officials say the swan doesn't appear to be damaged. Surveillance video showed a naked man driving away from a storage center in a stolen truck with the swan. In a Facebook posting Thursday, Polk County Sheriff's officials said they know "it's got to be hard to hide one of these," adding, "Someone has seen it." Investigators say they found the truck that was reported stolen in a nearby county.